What is it really like to drive at the Festival of Speed? “Have fun, but please do not crash!” These were the words that rang through my ears as I prepared for my first ever drive at the Goodwood Festival of Speed. You see, after weeks of negotiating and pleading, Alfa Romeo had finally agreed to let me drive one of their cars up Goodwood Hill. 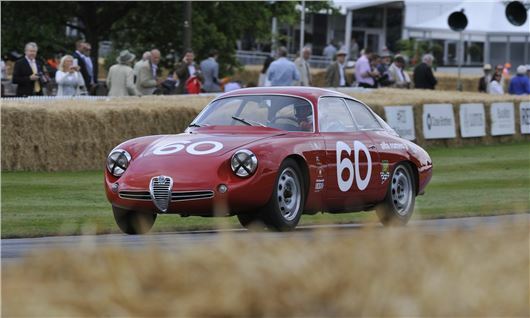 The car in question was a 1962 Alfa Romeo Giulietta Sprint Zagato (SZ) Coda Tronca – worth a cool £250,000. Now I think I should point out that I am not a racing driver. I have not competed in any events and I do not own any racing overalls. On the contrary, I am a guy who spends most of his time obeying the speed limits and cruising at 70mph on the motorway. Yet, I love the Festival of Speed and have always wanted to take part. So, here I was, behind the wheel of a classic racing car, sweating away in a set of fireproofs, with 150,000 people staring at me. Here I was, behind the wheel of a classic racing car, sweating away in a set of fireproofs, with 150,000 people staring at me. The events leading to my sweaty situation started an hour before. The hill had been shut for much of the afternoon, following an accident and I had assumed that this would result in a delay to my starting slot. However, I was wrong and following a panicked phone call from the Alfa Romeo team I was forced to sprint to the paddock, with five minutes to spare. Thankfully, there was lots of time - about 10 seconds in fact - for a short briefing on the car. Unfortunately, as I ventured out of the paddock, I realised that no one had shown me where the handbrake was. As a result, the Alfa was moving at a snail’s pace, with the four-cylinder engine struggling to move the wheels past the vice like grip of the handbrake. An average run up Goodwood Hill is 1.5 minutes - at this speed, it would take me four hours. Luckily, an Italian Alfa Romeo mechanic was nearby. Admittedly, he didn't speak English, but he helped me solve the problem by gesturing to the underside of the dash. It turns out the handbrake for the Giulietta is hidden under the dash and with a firm push the 1300cc engine found its feet and propelled me towards the start of the hill climb. The start itself is quite straight forward, although you have to wait in a line of cars as the marshals wave each one away. When it came to my turn, I did my best to perform a 'Hollywood start', by holding the revs, dropped clutch and flooring it away. The Giulietta Sprint Zagato (SZ) Coda Tronca - a former Le Mans car - is capable of 120mph and has 97bhp. However, its key lies in its spaceframe-chassis, which means it weighs very little. As a result, I was able to rocket away from the start in a cacophony of smoke and tyre squeals. There is a line of bricks – from the Indianapolis Speedway - at the start of the hill climb, which shake you like a bean in can, but once past this the little Alfa was able to build speed and head into turn one, an open right hander, before powering past Goodwood House and thousands of spectators. One of the biggest challenges of the hill climb is the third turn – a blind corner that has caught many drivers out in the past. In fact, Sir Chris Hoy smashed his Nissan GT-R here on Saturday, with its blind rise giving a false sense of security at you approach the corner. Thankfully, with a dab of the brake, the Giulietta was able to drop its speed, clips the apex before the long, steep run up the hill into the trees and past the flint wall. At speed, the nimble Alfa Romeo feels like a rally car, with a loud shrill that rattles your teeth. However, it wasn't loud enough to drown out the cheers of the crowd, as you pass the grandstands and head up the hill. From here, you keep the throttle down as you go through the wood and past the finish. Then that's it, you're at the top of the hill. As I climbed out, I was soaked in sweat and in agony, having sat in a cramped racing car for over an hour. However, I couldn’t complain, because I couldn’t stop smiling.